Banks come in all shapes and sizes and serve a multitude of customers. There are retail banks, probably the most familiar to the general public, and investment banks, commercial banks, central banks, and more. Each type of financial institution has a unique brand it presents to the world that helps drive traffic. 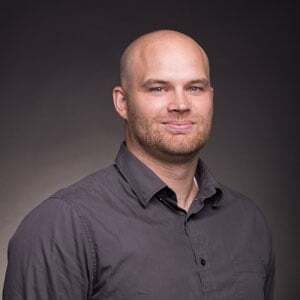 But, when you have so many establishments that fit under the financial umbrella, how can you make sure that your business signs fit your brand and announces who you are to potential customers in the best light? Here are types of bank signage that can help you portray your financial establishment and attract the customers you are catering to. Grab future customers’ attention with a towering pylon sign. Studies have shown that signage plays a huge factor in people visiting establishments they have never been to before. With a pylon sign, visitors will be able to see your bank sign from miles away, whether driving through the area or going down the highway. This is the first and most upfront way to showcase your bank’s brand to potential consumer. 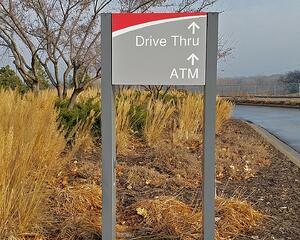 Banks have their front entrance and then many will have drive-thru lanes and a drive-thru ATM. Direct visitors while simultaneously promoting your bank’s brand. Wayfinding signs should be clean and easy to read, but that doesn’t mean they have to be bland. Incorporate your bank’s logo or colors onto your wayfinding sign. Not only does this keep your brand cohesive with your other bank signs, but it helps visitors know that the wayfinding sign is for your establishment and makes for an easier and stress-free visit. Now that your guests are inside your financial institution, continue branding your business with a lobby or front desk sign. First, it assures visitors that they are in the right place, especially in multi-tenant buildings. 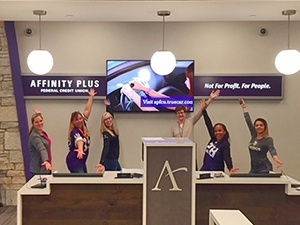 Second, although you have a pylon sign and wayfinding signs outside of your business, the lobby sign is what delivers the true first impression of what your company is all about. They are able to see the company brand in relation to the actual business. It ties everything together for a complete brand experience all the way up until the visitor is ready to work with you. Your bank is unique and your signs should reflect that. We can help. Spectrum has worked with many financial institutions from the First National Bank to Affinity Plus to Great Waters Financial and more. 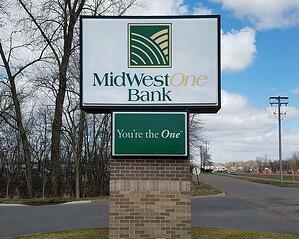 Give us a call to get your bank signs promoting your brand in no time.